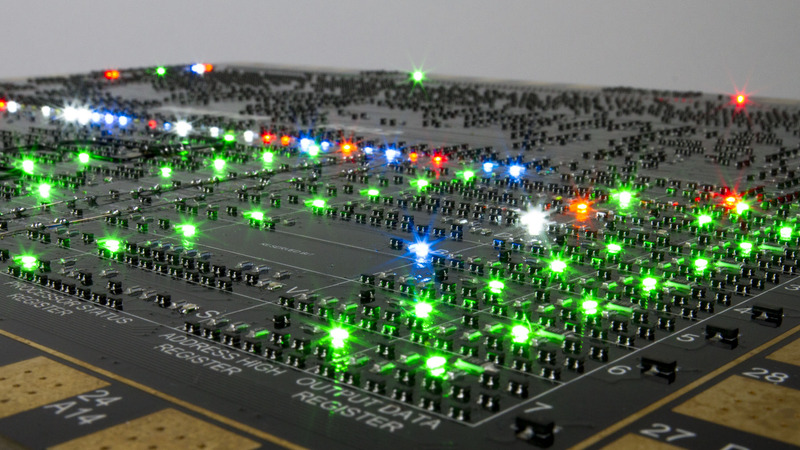 A dis-integrated circuit project to make a complete, working transistor-scale replica of the classic MOS 6502 microprocessor. The 6502 is the famous processor found at the core of such influential computer systems as the Apple ][, the Commodore PET, the Atari 400 and 800 home video game consoles, the BBC Micro, and the Tamagotchi digital pet. Slight variations of it were found in the Commodore 64, the Atari 2600, and the original Nintendo Entertainment System. What's with the name and capitalization? MOnSter 6502 is a play on the original manufacturer and device name (MOS 6502) as well as acknowledging its large size. It's a four layer circuit board, 12 × 15 inches, 0.1 inches thick, with surface mount components on both sides. How many components are there on the board? In total, there are 4769 components on the board. There are 3218 transistors and 1019 resistors that comprise the "functional" part of the 6502. In addition to these, there are also LEDs sprinkled throughout that indicate the values of various control lines, registers, and status bits, as well as additional transistors and resistors (not counted in those "functional" totals) that are necessary to drive those LEDs. We fabricated the first full-scale prototype and publicly demonstrated it (still in progress) at the the 2016 Bay Area Maker Faire. Since then we have brought it up to the stage of successfully running programs in assembly, BASIC, and Forth. Since the 6502 is just a microprocessor (CPU), about half of our work on the project (and most of our work over the past year) has actually been building up the capabilities around this processor — adding interfaces for a keyboard, monitor, and programming — so that you can actually use it. In the process of doing so, we have built up a single-board computer (a tiny motherboard) that uses the 6502 as its CPU, such that you can either use a socketed (vintage) 6502 IC, or the MOnSter 6502 through a cable. We have recently succeeded in bringing up the second prototype of the MOnSter 6502. This new version fixes a few issues that we encountered when bringing up the first version (resulting in a few patch wires) but also adds over 100 additional LEDs, including one for every instruction decode line on the 6502's decode ROM. Does it run at the full speed of an original 6502 chip? No. The MOnSter 6502 is relatively slow compared to the original, thanks to the much larger capacitance of the design. The maximum reliable clock rate is around 60 kHz. The primary limit to the clock speed is the gate capacitance of the MOSFETs that we are using, which is much larger than the capacitance of the MOSFETs on an original 6502 die. Can you hook it up inside an Apple ][ and run Oregon Trail? No, not directly. It's neat to think of plugging the MOnSter 6502's in-circuit emulator (ICE) in-circuit replica (ICR) cable directly into a socket inside an Apple ][, but that wouldn't actually work. The Apple ][ design relies on a number of clever tricks that derive timing for video generation and peripheral control from the main clock signal — all of which will fail if you need to run at a slower speed. There are some ways to get around limitations like these. For example, the Replica I computer (an Apple I clone) uses a Parallax Propeller chip to emulate a system clock and some of the timing-dependent external processing. So what can it do? It can act as an in-circuit hardware emulator for a 6502 integrated circuit, in any circuit that can run at a relatively low clock rate. 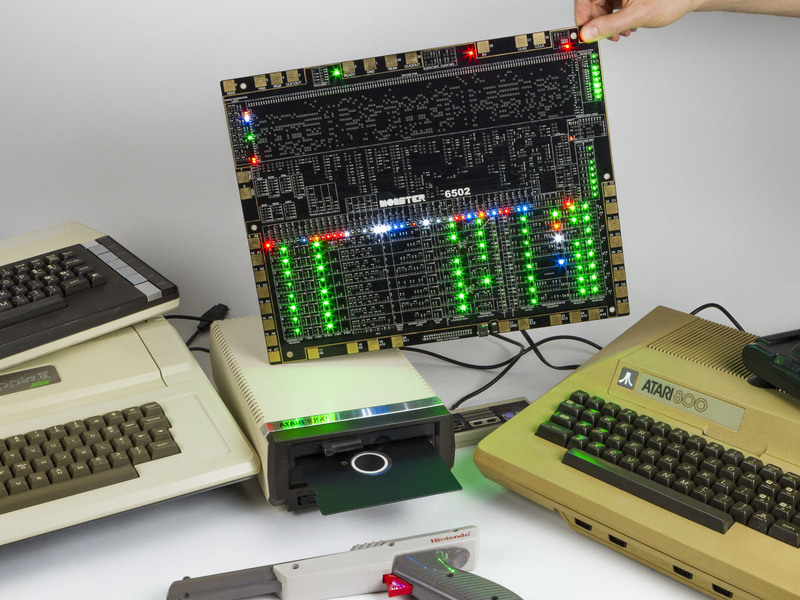 We're currently running it on a custom 6502 development board (the single-board computer that we mentioned earlier) and doing things like running running BASIC, much as you would on an Apple ][. We are definitely interested in finding other applications where it could be substituted for an original 6502. This has been a ~2 year project, thus far. The primary design work was done over six months, from July 3 to December 1, 2015. There have been several stages of reviews and revisions since then. Is it truly a "discrete 6502?" Not in the strictest sense. However, it really depends upon how picky you would like to be. The MOnSter 6502 uses the original dynamic NMOS logic design, implemented at the individual transistor level. Dynamic NMOS requires a large number of "transmission gate" transistors that are used to switch currents. For various technical reasons, only a 4-terminal MOSFET can make an effective NMOS transmission gate. Unfortunately, individually packaged 4-terminal MOSFETs are no longer commercially available. However, they do still make arrays of 2 or 4 MOSFETs on a single chip with a separate substrate pin. We used the 4-pack version — These are the quad transistor array chips that we mentioned earlier. Because these transistors do share a pin, there are (strictly speaking) integrated circuits in the MOnSter 6502. However, one might credibly argue that it is a discrete transistor design since there are not (for example) any logic gate chips in the circuit. What are those little gold squares around the border? The 40 square pads around the edge of the circuit board correspond to the 40 pins of the original 6502 integrated circuit. They're also designed to look like the wire-bond contact pads on an IC die — where the IC would be physically connected inside (for example) a 40-pin DIP package. These pads are functional contact points on the MOnSter 6502; you can hook up to them with alligator clips to probe or communicate with any pin. How much power does it draw? It draws up to roughly 2 A at 5 V, or 10 W total. The LEDs are a significant part of the power consumption. Can I see it in person? We've recently demonstrated the MOnSter 6502 at the 2017 Bay Area Maker Faire, at the 2017 Vintage Computer Festival West, at the 2017 World Maker Faire, and at the 2018 Vintage Computer Festival Pacific Northwest. Our next appearance will be at the 2018 Vintage Computer Festival West, August 4-5 in Mountain View, California. You can also come visit us by appointment only at Evil Mad Scientist Laboratories in Sunnyvale California for a demonstration. Please use our contact form to ask about available demonstration times. How big is the MOnSter 6502 compared to the original 6502 die? The original device was 153 × 168 mils (3.9 × 4.3 mm) or an area of 16.6 square mm. Given that ours is 12 × 15 inches, that makes it about 7000 times actual size. How big would the MOnSter 6502 be if it were made with through-hole parts instead of surface mount parts? About 19 square feet (1.7 square meters). How big would a 68000 microprocessor be at the scale of the MOnSter 6502? Also about 19 square feet (1.7 square meters). Are you going to make a 68000 next? How big would a modern CPU be at this scale? The Apple A8X, found in the iPad Air 2, contains about 3 billion transistors. (This is comparable to the number of transistors in modern desktop computer CPUs as well.) At the scale of the MOnSter 6502, that would take about 885,000 square feet (over 20 acres or 8 hectares) — an area about 940 ft (286 m) square. Are you going to make a dis-integrated modern CPU next? Are you going to make one out of vacuum tubes next? Are you going to make one out of relays next? No. (Not yet, at least.) This is very much a hobby project at the moment. However, we are considering various avenues for the future of the project. Sign up for our mailing list if you would like to receive any announcements that we may eventually make with regards to that kind of thing. It is definitely not cheap to make one of these. If we had to ballpark what one of these would sell for — assembled and working — it would certainly be larger than $1k and smaller than $5k. While the circuit board itself is large and a little bit expensive, the cost is actually dominated by the component and assembly costs of an extremely large number of tiny components, each of which is individually quite inexpensive. Add to that the setup and test costs of building complex things like these in small batches, and you'll immediately see how it adds up. Is there going to be a soldering kit version of this? 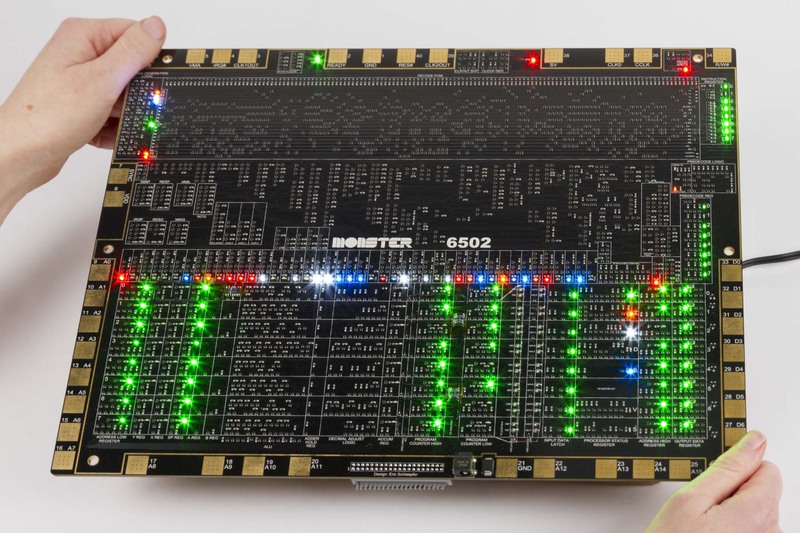 The MOnSter 6502 is a continuing work in progress, designed by Eric Schlaepfer, in collaboration with Evil Mad Scientist Laboratories. Together, we're the folks that brought you the "Three Fives" discrete 555 timer and the XL741 discrete 741 op-amp. Special thanks to Ken Shirriff, visual6502.org, Chuck Peddle, and Bunnie Huang. Please join our mailing list for occasional future updates.